One of the things that’s particularly important to me when I’m writing is that my books are as authentic as I can make them. That has led to me getting into some scrapes now and again, and it’s also meant that I have possibly limited my market a little bit. Let me give you a specific example with regard to The Cleaner. I used to live in the parts of East London that form the backdrop for the novel and I’m familiar with the young lads who comprise the gangs that Milton falls afoul of. I was intent on making the language as accurate as I could. In order to do that, I read plenty of contemporary fiction and wandered around those streets with my ears open. The end result is dialogue that is as accurate as I can make it. That has caused me to receive quite a few negative reviews. Some readers (I’ve sold a lot of books which means that, while they are a small percentage, there are still quite a number of them) found it very difficult to understand the dialogue. That’s particularly true when you bear in mind that most of my readers are in America. I think that this is a legitimate complaint. I struggled to read Irvine Welsh’s books for many years because the prospect of trying to translate his Glaswegian dialect was rather daunting. Whilst I’m not suggesting that these books are anywhere near as challenging as his, I’ve received emails from readers who said that they would have appreciated a glossary that explain some of the language used. And it’s not just my American readers. I’ve received comments from British readers who have suggested that the language cannot possibly be accurate. In particular, people have complained that the word “Fed” when referring to the police is an American term, and not one that you would hear on the streets of Hackney. I know that the use of the word is accurate, but anything that takes the reader out of the experience of enjoying the book is, ideally, to be avoided. If I was writing the book again today I think I would probably reduce the number of instances of accurate dialogue, if only just a little. I was guilty of this with The Black Mile, too. That dialogue is accurate as per the 1940s and the criminal milieu against which it is set. Again, I’ve received comments from readers who found that to be a little bit of a struggle. When I started writing, I think I was trying a little bit too hard to impress you with the depth of my research. That’s something that has changed over the years, and my intention now is to write fast, compulsive thrillers that you will struggle to put down. In attempting that, I try to avoid anything that would lead to the pace of the reading slowing down. 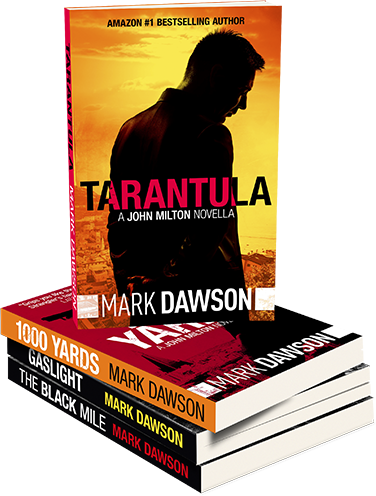 Accordingly, I was careful to use only a sprinkling of authentic dialogue when describing the sheep stations in the Australian outback in Headhunters, and the gangsters who roam the favelas in Rio for the last Milton novel, Redeemer. The bottom line is that there is a balance to be struck. Authenticity is important, but it must always be subservient to telling a cracking good tale. I’m interested to hear what you think about this. Did you enjoy that dialogue in The Cleaner or did it put you off? The accidental hero – is John Milton arrogant and incompetent? What Can You Expect From Me in 2019?